Another week of music gone by? Sometimes it is hard to keep up. The past week saw swinging vocals and blues at their best courtesy of Barbara Morrison, and youthful creativity at its most exuberant in the ensemble of Paris Strother, the latter featuring a revolving cast of like-minded young warriors visiting families for the holidays. The coming week celebrates youth and experience as well. McCoy Tyner has been a frequent employer of drummer Eric Kamau Gravatt, but Gravatt is also an accomplished bandleader. Still living among us in the Twin Cities, Gravatt tours with Tyner but finds time to come into the Artists Quarter with Source Code. The band, featuring vibist Dave Hagedorn and saxophonist Jim Marentic, performs tonight and tomorrow night at 9 pm. Six decades of performing have not slowed James Moody, and he makes his first Twin Cities appearance in years at the Dakota January 12-13 with an ensemble led by trombonist Jay Ashby and brother, guitarist Martin. Moody tops the polls consistently for his virtuosic flute playing, despite his claim that he is really just a saxophonist who plays flute on the side. It's a great side! Sets at 7 and 9:30 pm. He's 83. Don't miss this one. 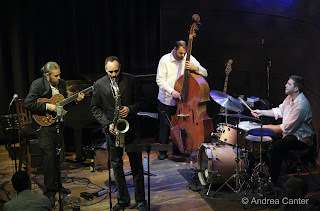 The modern fusiony vibes of the Atlantis Quartet hit prime time at the AQ on Wednesday night--some of the most interesting jazzmen in town, with Brandon Wozniak on sax, Zaac Harris on guitar, Chris Bates on bass and Pete Hennig on drums. They're cool to hear and fun to watch. On Halloween, they performed the full Love Supreme, a daring act with or without a saxophone but they brought their own spin to the iconic set. Even Coltrane would have approved. Finally, for a good introduction to what's happening with the youngest generation of jazz artists, check out the early set (free!) at the AQ on Thursday night when The Alternates perform. 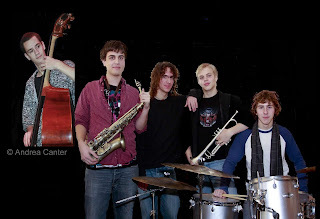 These are five guys interconnected through the various jazz programs of the Twin Cities as well as their auditions for the Dakota Combo. We'll be hearing a lot more from them. Stick around the AQ for the late show with Phil Aaron. And rest up, Phil Hey is at the AQ next weekend and then there's Inauguration Day madness! Photos: A fountain of youth comes to the AQ on January 15th with The Alternates (Cory Grindberg, Peter Nyberg, Chris Misa, Caleb McMahon and Rob Fletcher). The night before, the Atlantis Qt will be at the AQ (Zaac Harris, Brandon Wozniak, Chris Bates, Pete Hennig). Photos by Andrea Canter.